Hmmm… I wonder what the story behind the Chrome browser logo REALLY is? The ThinkFree company’s ThinkFree Office 3 logo is a strong contender. ThinkFree management was rumored to be aggrieved over the flagrant misappropriation of their original design work. Consider this side-by-side comparison on the right. The similarity is striking. 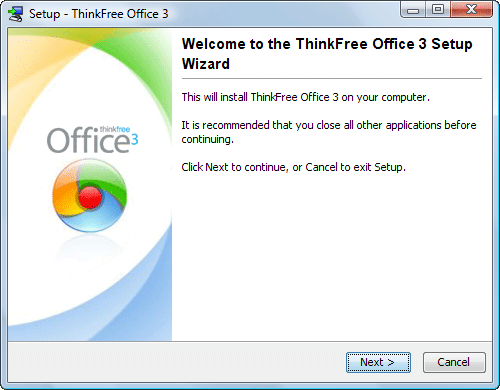 ThinkFree Office 3’s set-up wizard offers an opportunity for closer inspection. The logo is depicted here without a charcoal bezel. The version without the bezel more closely resembles Google Chrome’s distinctive four-colored orb, even though the color placement is not identical. Let us refer to this theory as the Pokemon Possibility. It is actually a hybrid sort of affair, combining elements of the real world, that Simon game from the 1980s, with Pokemon. Let us refer to this theory as Multi-source Mashup. Observe the combination of the physical world with the virtual world. Physical world representation is provided by both the Simon game (also present as a term of the equation in Theory 2) and a traditional web camera. The virtual world is represented by the round orb of the Firefox logo and the tangible presence of Google in its most general case, the Google corporate logo. Pokemon has not dropped out of the equation! Pokeball has equal weighting with Simon, as both contribute to the embedded orb within the Chrome design. The lemma to Theory 3 is a multi-source mashup without Google. It contains an unknown quantity which will be, of necessity, left to the reader to investigate. Necessity is motivated by my inability to figure out what that grey world globe surrounded by pointy-colored arrows is. Theory 4 is the most controversial of all, almost too unsettling for a rational mind to contemplate. Could the progenitor of the Google Chrome logo be… Windows Vista?! There is no conclusion. ThinkFree’s design seems to have the closest resemblance in my opinion. More conjecture is available from this pleasant 2008 post, The Inspiration Behind The Logo Design of Google Chrome from Digital Inspiration (tech a la carte) blog by Amit Agarwal. Upon further reflection, the Simon game is more innovative than I realized. Until now, I remembered it as an object of derision from when it appeared briefly in a 1980 movie about 18th century pirates living in the Caribbean titled, The Island (starring Michael Caine and based on the novel and screenplay of the same name written by Peter Benchley, the Jaws author). After raiding, boarding, pillaging, and incinerating a beautiful racing yacht and hanging the crew, the pirates inspect their ill-gotten gains. A Simon game is part of the bounty. Simon is notable in its own right. It was introduced by Milton Bradley as a computer game in 1978, making it one of the earliest computer games. The Think Free design theory is the most likely. They should have sued. Victim of copyright theifs at GOOG. Agreed. From what I read on labnol, Think Free wasn’t happy about it. Think Free would have had a pretty convincing case at the time, for some kind of copyright infringement, in my not-qualified opinion. An interesting post. (And hope you don’t mind – I just tweeted it). So nice of you to visit and leave a comment. And no, of course I don’t mind that you tweeted this. I am delighted in fact!